The trip would leave from Bamfield in the morning on a day with good weather and calm seas sometimes between May 13-16 or so. The Tuesday bird walk went to Springwood Park in Parksville. The morning was mostly sunny with a few clouds and calm winds. A male Anna's Hummingbird perched next to the trail giving us nice views at the beginning of the walk. We heard three Cassin's Vireos singing in the forest. We watched as four Red-breasted Nuthatches played on a tall conifer tree. Several Townsend's Warblers moved about high up in the Alder Trees. Throughout the morning we saw Orange-crowned Warblers gleaning insects and Yellow-rumped Warblers flycatching. A Red-tailed Hawk was perched on the big hydro lines for a good part of the morning. Our hearts were warmed by the sight of a female Mallard slowing crossing the road with ten Mallard Chicks following closly behind. 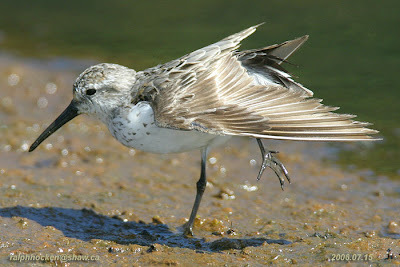 Western Sandpiper: Ralph Hocken Photo. Three Evening Grosbeaks, twelve American Goldfinch, six Dark-eyed Juncos, ten Band-tailed Pigeons, two Golden-crowned Sparrows and a White-crowned Sparrow are visiting feeders in the 100 block of Meridian Way in Parksville. ”Rare bird alert-Canada Warbler” The Canada Warbler first reported on Thursday April 21 has not been relocated again. A flock of Red Crossbills were seen feeding on fir cones on Little Mountain in Parksville. A pair of Audubon's Yellow-rumped Warblers, Varied Thrush, American Robin, Red-breasted Nuthatch, Orange-crowned Warbler, Ruby-crowned Kinglet, Cassin's Vireo and Purple Finch were heard and seen on Little Mountain. A Barred Owl and two Townsend's Warblers were exchanging calls from the tall Fir Trees next to the Englishman River in Parksville. A Cassin's Vireo was calling near the observation tower, a couple of Cooper's Hawks were interacting over the flats and a flock of over twenty-five Band-tailed Pigeons were in the trees above the path near the pond at the Shelly Road side of the Englishman River Estuary. A mixed flock of Dunlin, Least and Western Sandpipers was seen along the mud flats on the Plummer Road side of the Englishman River Estuary. Rufous Hummingbirds, Ruby-crowned Kinglets, Orange-crowned Warblers, Yellow-rumped Warblers, Common Yellowthroat and two Cassin's Vireos were seen at Legacy Marsh in upper Lantzville. A flock of Greater White-fronted Geese was seen flying high over Glenayr Drive in Nanaimo. Over fifty Greater White-fronted Geese were seen high over Madrona Point. Four Black-bellied Plovers were seen along the incoming tide at Pipers Lagoon in Nanaimo. “Rare Bird Alert-Canada Warbler”-- A possible Canada Warbler was seen in the area of 9th Street and Douglas Avenue in south Nanaimo. The Warbler had hit a window and then rested on a stump to recover. The owners of the property were able to identify the bird by it’s white eye ring, bold black necklace and yellow front throat, breast and underbelly. The back of the warbler was dark with no markings. 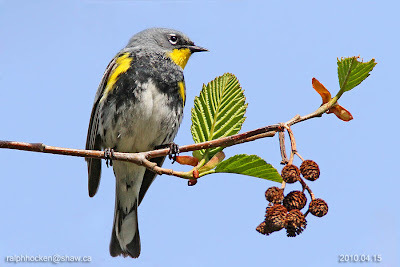 The bold necklace is unique to the Canada Warbler. A Hermit Thrush was seen in a backyard along Monterey Drive in Nanaimo. Violet-green, Tree, Northern Rough-winged, Cliff and Barn Swallows were seen flying low over Morningstar Ponds off Lee Road in Parksville. A Townsend's Solitaire was seen eating berries from a Maple Tree in the small green space on Ermineskin Avenue at the junction with Lodgepole Avenue in Parksville. The Tuesday bird walk went to Columbia Beach and French Creek. The morning was a perfect spring morning--sunny with a breeze off the Strait of Georgia. There were several flocks of Brant flying just above the water. 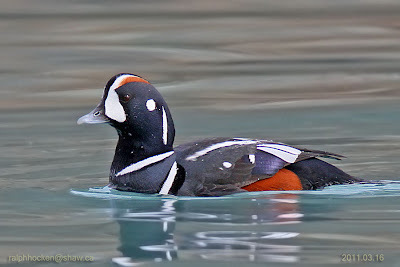 Surf Scoters, White-winged Scoters, Bufflehead, Red-breasted Mergansers, a Common Murre, a Marbled Murrelet, a Horned Grebe and a Red-necked Grebe were on the Strait. We saw several Yellow-rumped Warblers high up in the Alder trees along French Creek. An Orange-crowned Warbler was perched and singing at the top of a bush giving us great views. We spotted two Savannah Sparrows fly into the grass near French Creek. The Sparrows both perched on a Blackberry branch for us to view. An Osprey was seen flying above Cox Bay in Tofino. 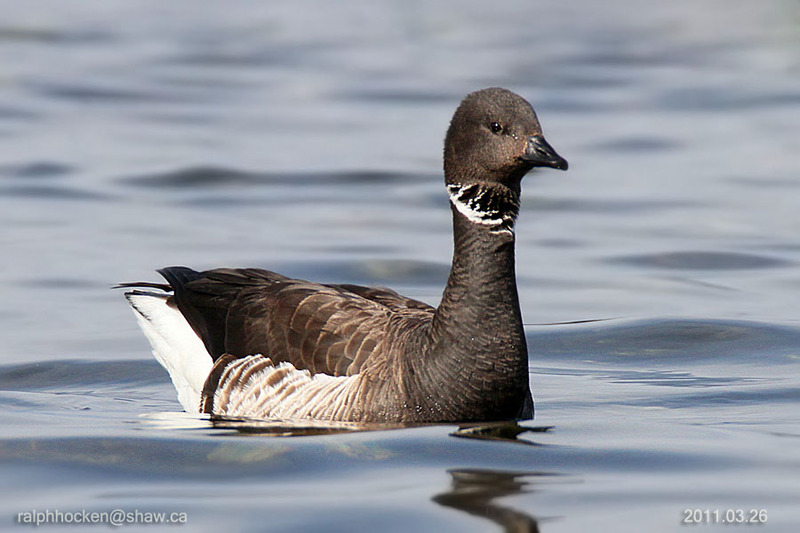 A large flock of Greater White-fronted Geese were seen heading north above Cox Bay in Tofino. A Mountain Bluebird was seen at Pipers Lagoon in Nanaimo. A Downy Woodpecker was seen in a front yard in the 5400 block of Oceanside Terrace in north Nanaimo. 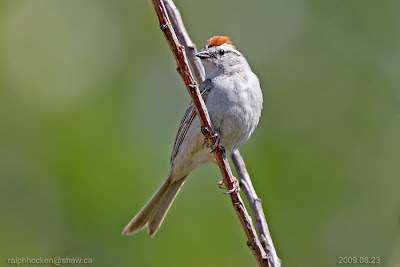 The Tuesday Bird Walk on April 26, 2011 will be going to Springwood Park in Parksville. We will meet at the Parksville Beach Community Park at the parking area in front of the Lions Playground at 9 A.M. or at the west end of Despard Avenue at about 9:20 A.M. The Tuesday bird walk went to Columbia Beach and French Creek. The morning was a perfect spring morning--sunny with a breeze off the Strait of Georgia. There were several flocks of Brant flying just above the water. Surf Scoters, White-winged Scoters, Bufflehead, Red-breasted Mergansers, a Common Murre, a Marbled Murrelet, a Horned Grebe and a Red-necked Grebe were on the Strait. We saw several Yellow-rumped Warblers high up in the Alder trees along Frech Creek. An Orange-crowned Warbler was perched and singing at the top of a bush giving us great views. We spotted two Savannah Sparrows fly into the grass near French Creek. The Sparrows both perched on a Blackberry branch for us to view. 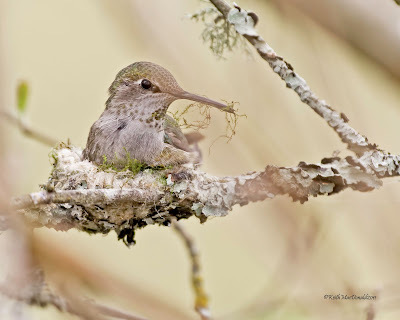 Anna's Hummingbird on nest, April 13, 2011: Keith MacDonald Photo. The Sunday bird walk went to Bowen Park in Nanaimo. The morning was sunny with a cool wind. The highlights included seeing a pair of Red-breasted Sapsuckers playing on the high trees. A Barred Owl called from the forest. We watched as Yellow-rumped Warblers and Orange-crown Warblers gleaned insects from the tall Alder Trees. Fourteen birders saw and heard the following thirty-one species of birds: Mallard, Turkey Vulture, Barred Owl, Glaucous-winged Gull, Chestnut-backed Chickadee, Anna's Hummingbird, Rufous Hummingbird, Downy Woodpecker, Red-breasted Sapsucker, Northern Flicker, Northwestern Crow, Common Raven, Bewick's Wren, Pacific Wren, Ruby-crowned Kinglet, Golden-crowned Kinglet, Brown Creeper, Bushtit, Red-breasted Nuthatch, American Robin, Varied Thrush, Hermit Thrush, European Starling, Orange-crowned Warbler, Yellow-rumped Warbler, Spotted Towhee, Red-breasted Nuthatch, Song Sparrow, Dark-eyed Junco, Pine Siskin and House Sparrow. Violet-green Swallows were seen swooping and circling over Millard Drive in Lantzville. The Birdstore has received three different reports of Anna’s Hummingbirds nesting. This is likely their second brood as probably the first brood failed because of the cold weather that we had in February. We had reports from Shell Beach Road in Evening Cove south of Nanaimo, Buttertubs Marsh in Nanaimo and along Aulds Road in north Nanaimo. A Mountain Blue Bird was seen at Pipers Lagoon in Nanaimo. 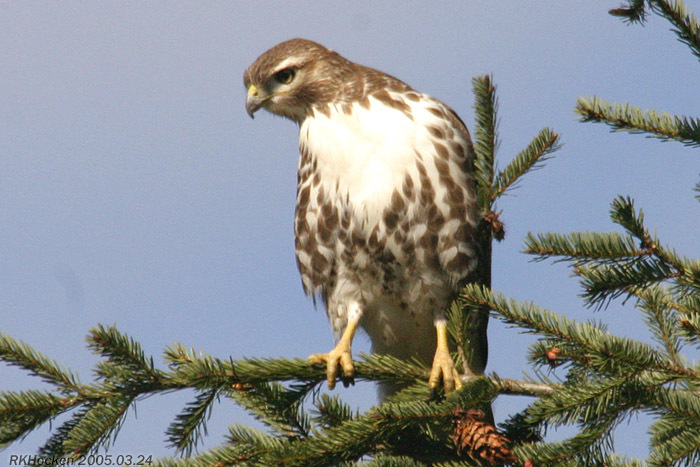 A Sooty grouse and a Northern Pygmy Owl were seen along Westwood Ridge in Nanaimo. Two American Goldfinch were seen along Dawkins Lane in Nanaimo. A flock of Evening grosbeaks and a flock of Red-winged Blackbirds are visiting feeders in South Wellington. Two Northern Rough-winged Swallows, Violet-green Swallows, Tree Swallows and Yellow-rumped Warblers were seen at the Morningstar Ponds off Lee Road in Parksville. 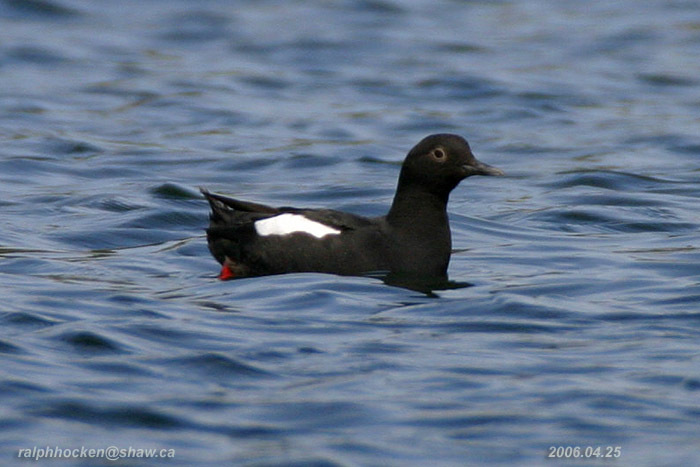 A Townsend’s Solitare was spotted in a backyard along Cameo Place on Gabriola Island. The Tuesday bird walk went to the Englishman River Estuary on the Plummer Road side. The morning was cloudy with a strong biting wind. At the start of the walk we saw a Rufous Hummingbird perched on the top of a short bush on one side of the trail. On the other side of the trail an Anna's Hummingbird was perched on top of a short bush. Just off the Englishman River, we spotted a Northern Shoveler and a Gadwall roosting in among a flock of Mallards, American Wigeon and Northern Pintail. A large flock of Green-winged Teal were feeding on the mud flats. Three Marbled Murrellets flew by just above the water heading down the Strait of Georgia and a Pigeon Guillemot was riding the waves offshore. 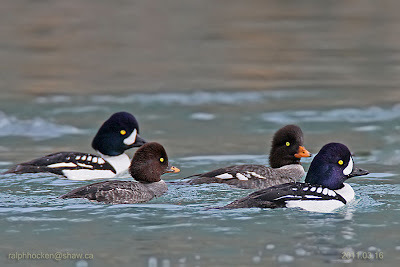 Large numbers of Brant Geese, Greater Scaup, Harlequin Ducks, Surf Scoters, White-winged Scoters, Long-tailed Ducks, Bufflehead, Common Goldeneye and Red-breasted Mergansers were moving down the Strait throughout the morning, giving us great views. Northern Shoveler, Northern Pintail, Green-winged Teal, Greater Scaup, Harlequin Duck, Surf Scoter, White-winged Scoter, Long-tailed Duck, Bufflehead, Common Goldeneye, Red-breasted Merganser, California Quail, Common Loon, Horned Grebe, Red-necked Grebe, Double-crested Cormorant, Great Blue Heron, Turkey Vulture, Bald Eagle, Black Oystercatcher, Mew Gull, California Gull, Thayer's Gull, Glaucous-winged Gull, Pigeon Guillemot, Marbled Murrelet, Anna's Hummingbird, Rufous Hummingbird, Belted Kingfisher, Northern Flicker, Pileated Woodpecker, Northwestern Crow, Common Raven, Chestnut-backed Chickadee, Bushtit,Golden-crowned Kinglet, Ruby-crowned Kinglet, American Robin, Varied Thrush, Spotted Towhee, Song Sparrow, White-crowned Sparrow, Golden-crowned Sparrow, Dark-eyed Junco and Purple Finch. American Goldfinch and a large flock of Yellow-rumped Warblers were seen at Buttertubs Marsh In Nanaimo. A Flock of Pine Siskins and one Bewick’s Wren were seen visiting a backyard in the 2700 block of Neyland Road in Nanaimo. Two Common Red Polls were seen along Dover Road in Nanaimo. Monday April 18, 7.30 pm at Springwood School in Parksville. 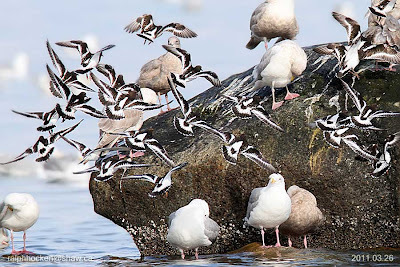 The Tuesday Bird Walk on April 19, 2011 will be going to Columbia Beach. We will meet at the Parksville Beach Community Park at the parking area in front of the Lions Playground at 9 A.M. or at the parking area off Admiral Tryon Blvd off Columbia Drive on the Oceanside of Highway 19a at about 9:20 A.M. There will be no Sunday Bird Walk on Easter Sunday April 24, 2011. The Sunday bird walks will resume on May 01, 2011. The Sunday Bird Walk, April 17, 2011 will be going to Bowen Park in Nanaimo. We will meet at the Backyard Store at 9:00A.M. or at the parking lot in front of the Lawn Bowling Green at Bowen Park at about 9:20A.M. 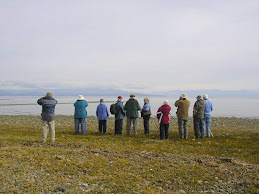 The Tuesday bird walk went to the Englishman River Estuary on the Plummer Road side. The morning was cloudy with a strong biting wind. At the start of the walk we saw a Rufous Hummingbird perched on the top of a short bush on one side of the trail. On the other side of the trail an Anna's Hummingbird was perched on top of a short bush. Just off the Englishman River, we spotted a Northern Shoveler and a Gadwall roosting in among a flock of Mallards, American Wigeon and Northern Pintail. A large flock of Green-winged Teal were feeding on the mud flats. 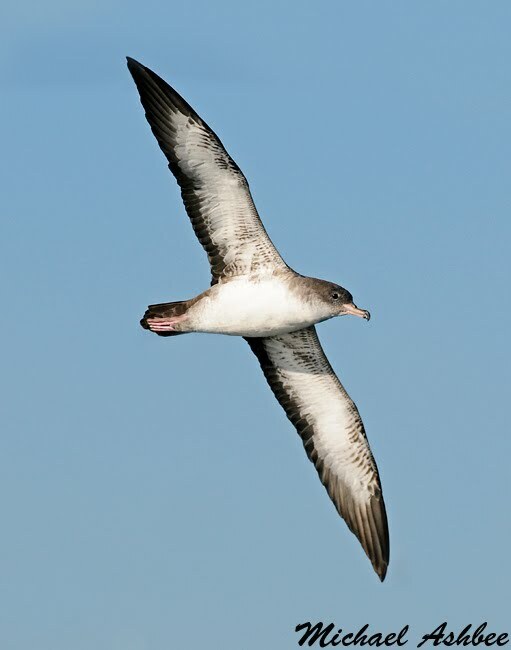 Three Marbled Murrelets flew by just above the water heading down the Strait of Georgia and a Pigeon Guillemot was riding the waves offshore. Large numbers of Brant Geese, Greater Scaup, Harlequin Ducks, Surf Scoters, White-winged Scoters, Long-tailed Ducks, Bufflehead, Common Goldeneye and Red-breasted Mergansers were moving down the Strait throughout the morning, giving us great views. A.M. or at the corner of Plummer Road and Shorewood Drive at about 9:15 A.M. The Rufous Hummingbirds have arrived---we have had numerous reports from Cedar to Deep Bay of Rufous Hummingbirds. Two Band-tailed Pigeons were seen perched on a high snag along Despard Avenue near Meridian Way in Parksville. The Sunday bird walk went to Buttertubs Marsh in Nanaimo. It was cloudy with light rain and strong winds throughout the morning. The highlights included seeing an Osprey fly over and circle above us at the start of the walk. Over one hundred Violet-green Swallows and a few Tree Swallows were hawking insects just above the water. We heard and then saw one Purple Martin at the end of the walk. 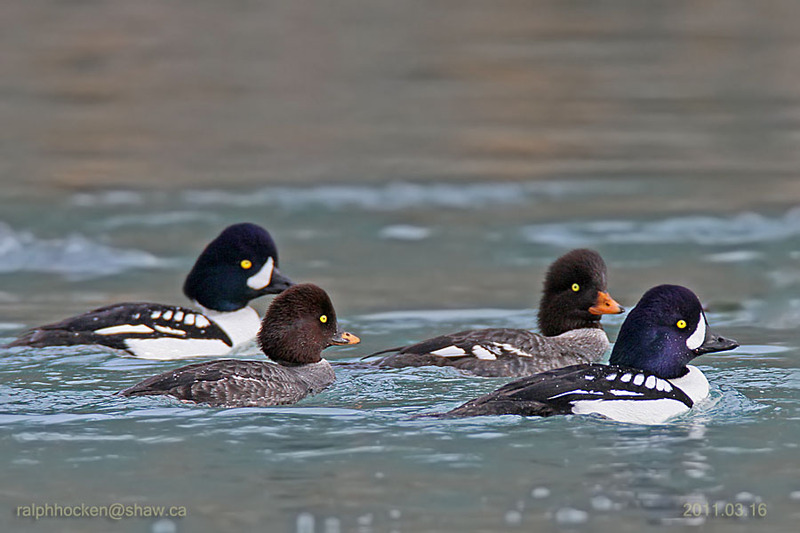 Five Evening Grosbeaks were spotted landing in a group of Alder Trees at the Fairwinds Golf Course in Nanoose Bay. 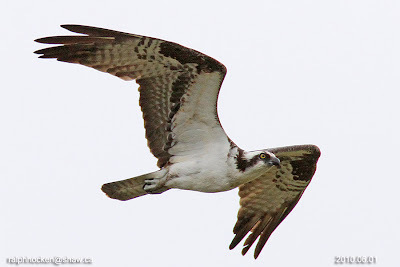 An Osprey was seen flying high and calling over the Colliery Dam Park in Nanaimo. A Silver Pheasant was seen along Fillinger Crescent in Nanaimo. An Osprey, carrying a fish, was seen heading south from Highway 19 and Nanaimo Lakes Road in Nanaimo. The Tuesday bird walk went to the Little Qualicum River Estuary. The morning started out cloudy with rain and a sharp wind off the Strait of Georgia, however the morning finished with only cloudy skies and no rain. Harlequin Ducks, Black Oystercatchers, Black Turnstones and large numbers of Bonaparte's Gulls, Mew Gulls, California Gulls, Thayer's Gulls, Glaucous-winged Gulls and a Herring and Western Gull lined the rocks along the shore line from the viewing platform in Qualicum Beach. A hugh raft of Brant Geese, Greater Scaup, Surf Scoters, White-winged Scoters, Black Scoter, Bufflehead, Common Goldeneye, Barrow's Goldeneye, Common Mergansers, Red-breasted Mergansers, Pacific Loons, Common Loons, Horned Grebe's and a Red-necked Grebe were just off shore from the viewing platform. We spotted a Northern Shrike at the estuary. As we left the mouth of the river we saw a massive flock of Gulls lift from the water. The flock stretched from Qualicum Bay past Chrome Island and on towards the mainland---IT WAS A SPECTACULAR SIGHT! European Starling, Yellow-rumped Warbler, Spotted Towhee, Song Sparrow, Dark-eyed Junco, Red-winged Blackbird, Brewer's Blackbird, House Finch, Pine Siskin and House Sparrow. An Osprey was heard calling from above Harewood Creek off Glengary Crescent in Nanaimo. A Yellow-rumped Warbler was spotted in the 2000 block of Labrieux Road in “Nanaimo. Violet-green Swallows were seen along Doumont Road in Nanaimo. The Bird Store just received a late unconfirmed report of a Red-breasted Grosbeak at feeders along Cedar by the Sea in Cedar. 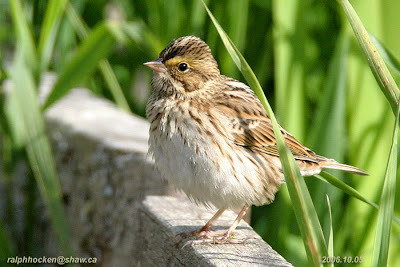 The Tuesday Bird Walk on April 12, 2011 will be going to the Plummer Road side of the Englishman River Estuary in Parksville. We will meet at the Parksville Beach Community Park at the parking area in front of the Lions Playground at 9 A.M. or at the corner of Plummer Road and Shorewood Drive at about 9:15 A.M. The Sunday Bird Walk, April 10, 2011 will be going to Buttertubs Marsh in Nanaimo. We will meet at the Backyard Store at 9:00A.M. or at the parking lot off Bowen Road at about 9:20A.M. The Tuesday Bird Walk on April 05, 2011 will be going to the little Qualicum River Estuary in Qualicum Beach. We will meet at the Parksville Beach Community Park at the parking area in front of the Lions Playground at 9 A.M. or at the viewing platform near Garrett Road and Highway 19a at about 9:20 A.M. The Sunday bird walk went to Neck Point Park in Nanaimo. The morning was cloudy with strong winds. 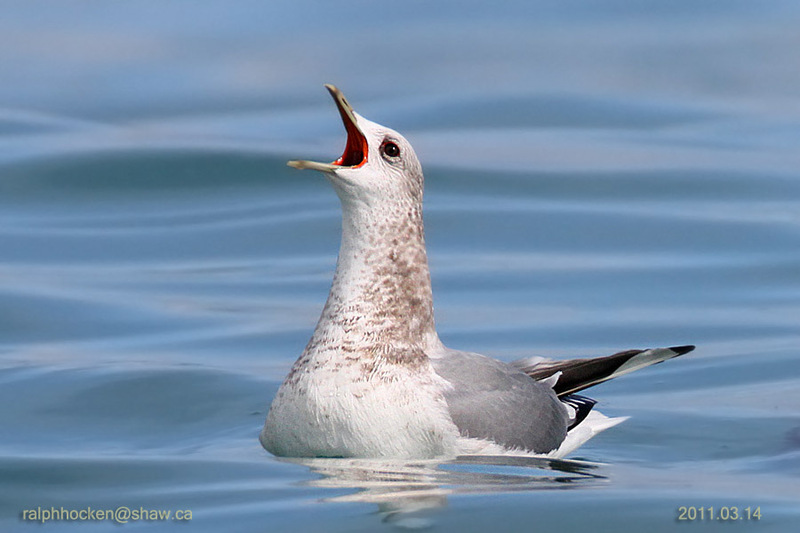 The highlights included several flocks of Bonaparte’s Gulls flying low over the water. A huge flock of Mew Gulls, Thayer's Gull, California Gulls and Glaucous-winged Gulls was perched near shore until a couple of Bald Eagles flew overhead. The Gulls all lifted from the water but returned shortly after. There were several Yellow-rumped Warblers in some Alder Trees and we spotted two Yellow-rumped Warblers feeding on the rocks near the shore. We heard an Orange-crowned Warbler singing along the trail—a first for the year. Canada Geese, Mallard, Double-crested Cormorant, Brandt's Cormorant, Pelagic Cormorant, Bufflehead, Northern Pintail, Greater Scaup, Common Goldeneye, Harlequin Duck, Red-breasted Merganser, Common Merganser, Horned Grebe, Red-necked Grebe, Turkey Vulture, Bald Eagle, Red-tailed Hawk, Bonaparte’s Gull, Mew Gulls, Thayer's Gull, California Gull, Glaucous-winged Gull, Common Loon, Pigeon Guillemot, Northern Flicker, Pileated Woodpecker, Downy Woodpecker, Common Raven, Northwestern Crow, European Starling, American Robin, Varied Thrush, Yellow-rumped Warbler, Orange-crowned Warbler, Ruby-crowned Kinglet, Golden-crowned Kinglet, Anna’s Hummingbird, California Quail, Chestnut-backed Chickadee, Brown Creeper, Bushtit, Red-breasted Nuthatch, Pacific Wren, Bewick's Wren, Spotted Towhee, Song Sparrow, Golden-crowned Sparrow, House Finch, Pine Siskin, Purple Finch, Red-winged Blackbird and Dark-eyed Junco. Six to eight Evening Grosbeaks are visiting feeders in a backyard in the Hospital area in Nanaimo. Over thirty Evening Grosbeaks are visiting feeders in the Cinnabar area of south Nanaimo. Two Eurasian Doves were seen along Glenayr Drive in Nanaimo. A Rufous Hummingbird of the season was spotted visiting feeders in Fanny Bay for the first time this year. A Yellow-rumped Warbler was visiting a suet feeder in Pheasant Valley in Nanaimo. Canada Goose, Bran, Eurasian Wigeon, American Wigeon, Mallard, Northern Shoveler, Northern Pintail, Green-winged Teal, Surf Scoter, Common Goldeneye, Common Merganser, Red-breasted Merganser, Red-throated Loon, Pacific Loon, Common Loon, Pelagic Cormorant, Great Blue Heron, Bald Eagle, Bonaparte's Gull, Mew Gull, California Gull, Thayer's Gull, Glaucous-winged Gull, Pigeon Guillemot, Rock Pigeon, Anna's Hummingbird, Belted Kingfisher, Red-breasted Sapsucker, Downy Woodpecker, Northern Flicker, Pileated Woodpecker, Steller's Jay, Northwestern Crow, Common Raven, Chestnut-backed Chickadee, Red-breasted Nuthatch, Brown Creeper, Pacific Wren, Golden-crowned Kinglet, Ruby-crowned Kinglet, Mountain Bluebird, American Robin, Varied Thrush, European Starling, Yellow-rumped Warbler, Spotted Towhee, Song Sparrow, White-crowned Sparrow, Golden-crowned Sparrow, Dark-eyed Junco, Brewer's Blackbird, Purple Finch and House Finch. The Gray Catbird is still visiting Suet Feeders along Carlton Road in Nanaimo. 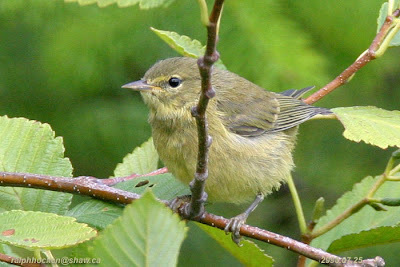 An Orange-crowned Warbler was spotted in a Plum Tree at Neck Point Park in Nanaimo. A Rufous Hummingbird is visiting feeders along the Nanaimo River Road in south Nanaimo. A Rufous Hummingbird was spotted at a feeder on Turner Road in Parksville. Nanoose Field Naturalists Meeting . Guest Speaker--Professor Tim Stokes (Chair of the Department of Earth Sciences VIU) will give a presentation on the Geology of Vancouver Island. Monday April 25, 7.30 pm at Springwood School in Parksville. off Hammond Bay Road at about 9:20A.M.